Summon: Trigger the Exalt of each friendly creature. Temple Patriarch is a rare Tribunal Temple creature card. It is part of the Houses of Morrowind expansion. 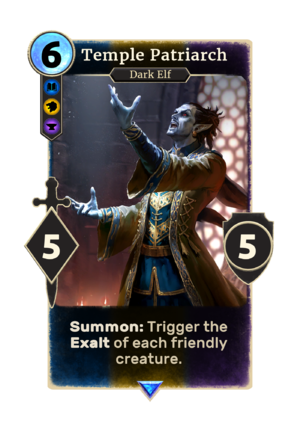 In addition to the card's availability in the Houses of Morrowind expansion, two copies are included in the Tribunal Glory theme deck. "The gods guide and protect us." "We bask in the glory of the Tribunal!" "May the gods have mercy on you." This page was last modified on 2 March 2019, at 00:43.